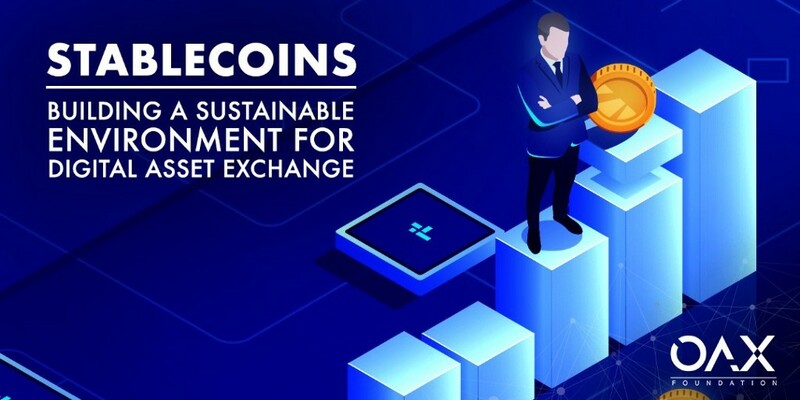 Over the course of this project we’ve repeatedly stated how one of our aims is to help bring digital asset exchanges into the mainstream. This requires a sustainable operating environment based on principles of openness and transparency. The OAX platform is one part of this, but there are other related elements that will help truly bring about our vision for the future. Stablecoins, in particular, have a crucial role to play. In short, stablecoins are a type of digital asset which seek to reduce price volatility of trading through a variety of methods, the most common to date being by linking their value to real world assets like USD or gold. One of the functions that can be provided by stablecoins is that they can support fiat-to-digital asset exchange. Additionally, they can also help to reduce market risk by providing a stable store of value in what has to date proven to be a volatile asset class. Some notable examples are Tether, CircleUSD and TrueUSD, and many more have come into the market since the middle of last year. Currently, concerns over volatility and security are keeping many mainstream investors, especially institutional investors, away from digital assets. But because stablecoins offer both stability and transparency, they have the potential to overcome these concerns and so provide one of the keys to the mass adoption of digital assets. supporting corporates and individuals with decentralized solutions powered by a secured stablecoin.